Firstly, we are not saying that you need to avoid exercise all together, far from it. Staying active during pregnancy has many benefits, from preparing you for labour to strengthening your core muscles which can help with post-natal recovery. Whether you’re an avid gym-goer or an exercise novice, pregnancy is sure to raise a few questions regarding safety, so we have put together a few pointers to guide you through the ‘dos’ and ‘don’ts’ of pre and post-natal exercise. We all have different fitness levels, so make sure your follow your own lead when it comes to exercising during or after pregnancy and don’t be tempted to keep up with others. Listen to your own body and respond accordingly. There are some great pre and post-natal exercise classes with qualified instructors available at your local 1Life centre and these are great places to start. They range from water-based classes to ease aching joints to relaxing yoga – check out what your local gym has to offer. The benefits of joining a specialist pregnancy fitness class is that the instructors are on hand to check that you are doing the exercises correctly while setting an appropriate pace to avoid any injuries. Providing you are not completely new to exercise you can keep your exercise intensity at a moderate level during pregnancy but it’s important you don’t get too hot or put any unnecessary strain on your body. This is also true for post-natal exercise when the muscles and joints are still delicate – they will need time to gradually regain strength. There will be varying degrees of what is classed as ‘moderate’ depending on your fitness level but as a guide you shouldn’t be raising your heart rate too much or getting overly sweaty. The level you are aiming for is to be able to hold a conversation while you are training. If you can’t, it’s important you think about toning it down to a safer level. 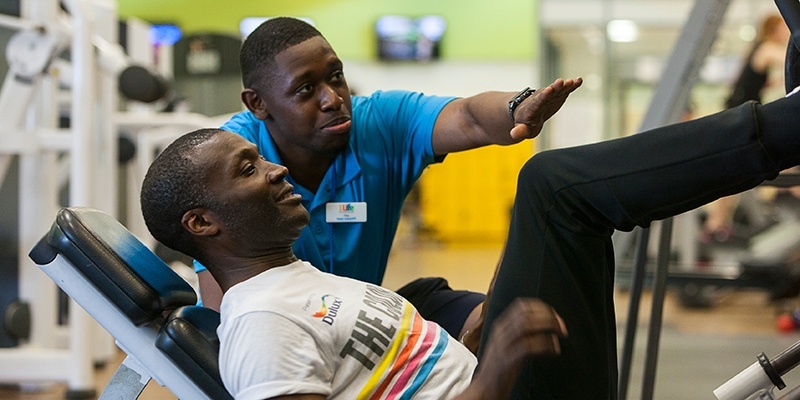 If you need more help, guidance or support on this please speak to a member of the 1Life gym and PT team – they will be experienced and qualified to help you. Providing your pregnancy is classed as low-risk and your medical professional is happy for you to do so, there shouldn’t be any reason why you would need to drastically adjust your training schedule in the first and second trimester. For example, if you have always been a regular runner and provided you feel comfortable and able there should be no reason why you can’t continue jogging/running. As we have said before, the key is to listen to your body and don’t overdo things. It’s worth noting that competitive sports should be ruled out during pregnancy, as well as racquet sports, cycling, martial arts and horse riding etc. all of which put you at greater risk of injury. Be sensible when it comes to choosing an exercise form during pregnancy, if you weren’t a runner before, now isn’t the time to take it up as a new hobby. If you are new to exercise and recognise the benefits working out can offer you and the baby during pregnancy, it’s best to start slowly and allow your body time to adjust to the new demands. Opt for gentle forms of exercise as a starting point such as walking or swimming which are great for building fitness without putting too much of a strain on your body. You’ve probably all seen pictures in the media of heavily pregnant women still displaying signs of a toned six-pack, this is not only unrealistic for the majority of people, but it can also cause more damage than good. It is not recommended to work on the abdominal muscles after the first trimester as the muscles need to be able to lengthen and stretch to accommodate your growing baby. Overly working the abdominal muscles simply makes it more difficult for the baby to get in to the optimal position ready for birth. Instead, it is worth focusing on strengthening your pelvic floor muscles and working on the deeper core muscles responsible for protecting your back and stabilising your spine. Pilates is a great way to do this and is available at many 1Life centres. Generally, getting back to your exercise programme after giving birth takes at least six weeks and it’s advised to wait until you have had your GP check-up and they’ve given you the green light to exercise. This time frame could be longer for those mums who’ve had a caesarean. Although you might have received the go-ahead from a medical professional you’ll still need to take things slowly to start with, don’t expect to be back at your pre-pregnancy fitness level straight away, but over time you will get there. Your joints and ligaments are much more supple in the months after giving birth so be aware not to twist too much or over-stretch as you’ll be much more prone to injuring yourself which, could set you back. If you are struggling to find time to fit in exercise once your baby has arrived then you might need to get creative. Why not test out the new pushchair and get out in the fresh air for a walk? Or play a game of chase if you have an older child to entertain too and get in to the habit of bending your knees rather than you back when you pick your baby up to strengthen your thigh muscles. You could also look in to a local buggy-fit class which can be a great way to meet other new mums. However you’re choosing to get active after the birth of a baby, take it steady and take care. For more advice and information about training plans and programmes please contact us here.